The results of your students' scores will get them noticed because we build skills that last a lifetime. Vogel Prep provides students with the most innovative, creative, and successful test preparation regimen, taught by Vogel Prep's professional instructors. The results speak for themselves. 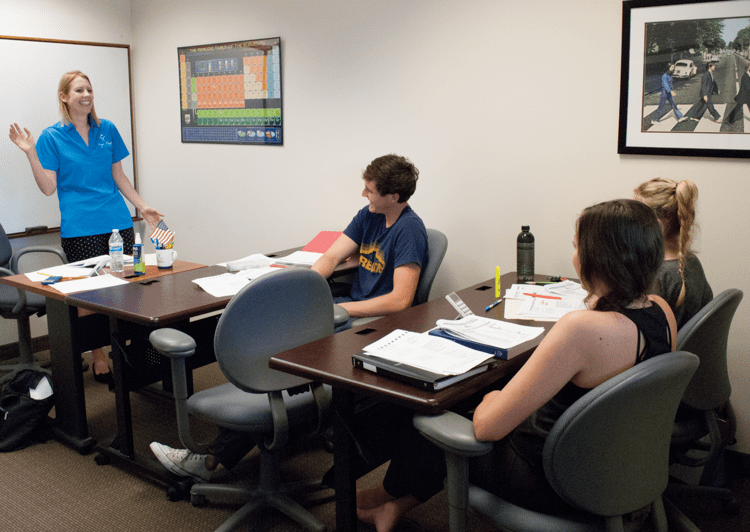 No one in the Valley does test prep better than Vogel Prep Tutors. Vogel Prep students have a long history of achieving outstanding results on benchmark tests. That fact can be attributed largely to our personalized approach and expertise in adopting revolutionary test preparation strategies that fit your student! Only by understanding a test's underlying characteristics can a student meet or exceed his potential. We employ a holistic approach to test preparation that includes the utilizing the best tutors, exploring test design, implementing strategic solutions, and practicing on hundreds of test questions! At Vogel Prep, we expect to see SAT result gains of 100-300 points on average after our 24 hour package for the old SAT. We have seen higher (520 points). We have seen ACT result gains of 3-7 points, and our record is 11 points. If a student is willing to work hard and willing to embrace our strategies, then the student will improve. We have also had perfect scores for both the SAT and the ACT. Not sure whether the ACT or SAT is your best test? Take Vogel Prep's ACT vs. SAT Comparison Test and have the opportunity to review an in-depth document that details strengths and weaknesses on both tests and provides a summary analysis of your performance! Practicing for major tests by taking real practice tests, under real conditions, gives students immeasurable benefits. Learning to manage diet, sugar levels and sleep as well as coping with test fatigue and acquiring familiarity with test scoring rules can be priceless. We offer your student the opportunity to experience and take real tests, while fighting the anxiety that naturally comes along with standardized testing; providing students with powerful tools in building confidence and scores. Vogel Prep's center offers “Actual Conditions” practice tests several times per month. To register for a practice test, contact our office at (480) 990-7374, or register online. We offer preparation for a variety of tests including: PSAT, SAT, ACT, SAT Subject Tests and APs. We also help college students with preparing for some graduate tests like LSAT, GRE or GMAT or middle-schoolers with prep school tests like the SSAT, ISEE and the famous test for private catholic schools in the Valley, the HSPT. Let us know your needs and we will try to help. To get started schedule a FREE diagnostic test—CLICK to see our assessment schedule! To Get Started, Schedule a Free Diagnostic Test—Click Here to See Our Assessment Schedule! The PSAT (Preliminary SAT) is a two-part exam that is very similar to the SAT. The parts are Evidence Reading and Writing and Math. Not to be taken lightly, the PSAT is generally the first indicator that colleges and universities use for scholarship and placement purposes. When do I take the test? Most students take the PSAT in the fall of their junior year in high school. In addition, some students choose to take it during their sophomore year, which is strongly encouraged as a dry run for the Junior year. However, only scores on the PSAT during your student’s junior year are used to determine National Merit Scholars who qualify for merit-based scholarships distributed throughout the United States. How do I register? You must sign up for the PSAT at your high school. The PSAT is administered during October of every school year. There is a fee associated with taking the PSAT, but there are fee waiver opportunities for certain students and some schools pay for their students to take the test. What is the test’s structure? The PSAT consists of one 60-minute Reading section, one 35-minute Writing and Language section, followed by two math sections: one 25-minute without calculator and one 45-minute with calculator. Each section will have a score that will range from 160 to 760. The overall scores will be on a scale from 320 to 1520. The new PSAT will not pair up exactly with the SAT, as the scales are not the same. The SAT will have a scale from 400 to 1600. This indicates a higher level of difficulty on some of the questions. Should I prepare for the PSAT even though my score does not go to colleges? For most students, the answer is yes! An exceptional performance on the PSAT can lead to recognition and scholarships. The PSAT/NMSQT is the test used to qualify students for National Merit Scholarships. Furthermore, preparing for the PSAT can help identify areas of relative strengths and weaknesses far enough in advance so that a student can take proactive steps to earn higher SAT scores. Also, preparing for the PSAT is essential preparation for the future SAT. 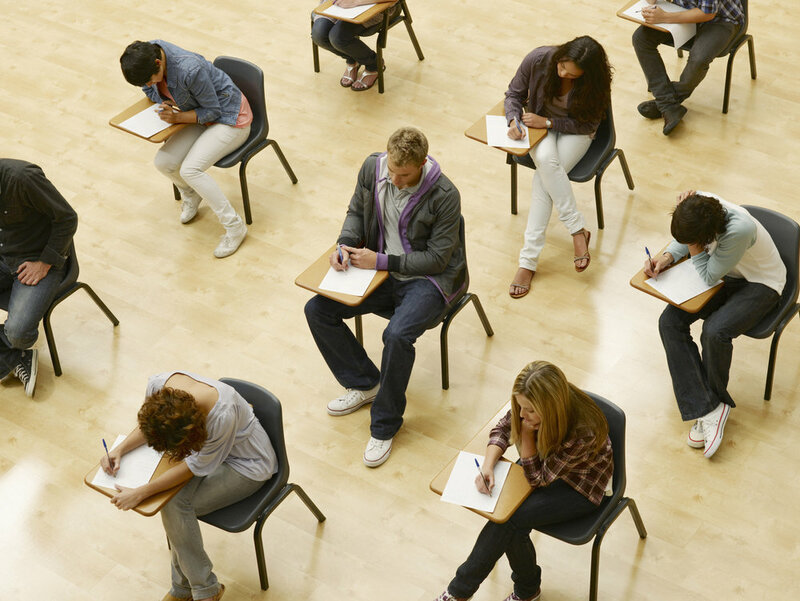 Taking the SAT early gives students a significant competitive advantage over their peers. Finally, we have found that the best way to maximize test scores is to use a step-up process. By preparing for the PSAT, one takes the first step toward achieving the highest possible SAT scores. How high must my PSAT scores be to qualify for a National Merit Scholarship? The actual score varies from year to year and from state to state. A good estimate based on the new PSAT for Arizona kids should to be in the range of 1480 or above. This would have been the equivalent of being in the top 4% for Arizona. 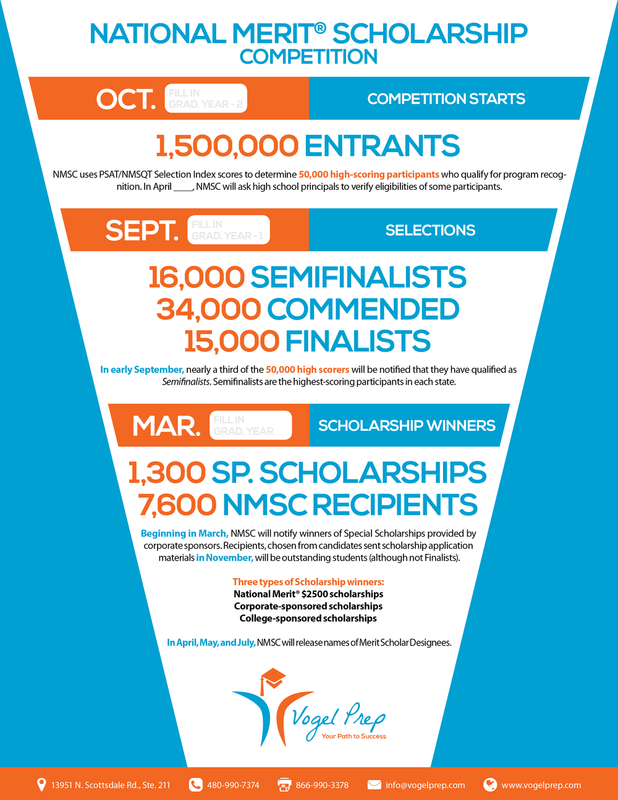 Of the approximately 1.5 million students who take the PSAT annually, about 50,000 (approximately 4%) receive National Merit Scholarship recognition. Of those, approximately 34,000 receive letters of commendation. The other 16,000 become semifinalists. Not surprisingly, most semifinalists become finalists. In fact, about 15,000 students are rewarded. As many as 11,000 students receive financial awards, worth a total of $50 million for undergraduate study. All students who receive such recognition can list this outstanding accomplishment on their college applications. For more information on the National Merit Scholarship process please see our handout here. The SAT is one of two standardized tests used by colleges as part of their admission requirements. The SAT measures language skills in both reading and writing as well as math reasoning skills. It is used for admission and scholarship eligibility at most colleges and is required by the NCAA for those athletes who hope to compete in sports once they are accepted into college. The SAT Subject Tests, (formerly SAT II), consists of more than 20 subject areas and are achievement tests designed to measure subject area knowledge. Many colleges use the Subject Tests for admission, for course placement, or to advise students about course selection but only some selective colleges and universities require them. These can be taken the same dates as the SATs, except in March when there are no SAT Subject Tests administered. For more information on SAT Subject Tests, click here. When does my student take the test? The SAT is administered in August, October, November, December, March, May, and June of each school year. Most students take the SAT during the second semester of their junior year. The best rule of thumb with the SAT is: “the earlier and more often, the better.” To see test dates for the current academic year, click here. How is it scored? The new SAT does not penalize students for wrong answers. Scores on each section range from 200-800 points. The scores from each section are combined, and the highest possible combined score is 1600. How many times can my student take the test? Students can take the test multiple times without penalties, but we recommend students take the exam no more than three times. What should my student bring to the test? Your student should bring an approved calculator, a snack, water, pencils, his or her ticket, and a picture ID. Do not bring a phone. Which calculators are approved? Calculators permitted while testing are graphing calculators, scientific calculators, and four-function calculators (not recommended). The following devices are NOT permitted as a calculator: laptop or a portable/handheld computer, pocket organizers, cell phone calculators, calculators with QWERTY keypads (e.g., TI-92 Plus, Voyage 200), and calculators that use electrical outlets, make noise, stylus or have a paper tape. For more specific information, read the calculator policy here. What are the costs of the test? The test costs change year by year. In 2018, it was either $64.50 or $47.50, depending on whether you take the test with the essay or without. A late registration fee is available after the regular registration dates but it adds $29 to the cost. After the late registration deadline there is still a chance to take the test if you get into a wait-list. This wait-list fee is an additional $51 and will only be charged if you are able to take the test. Can I change a date once registered? Yes, life situations may keep your student from being able to meet a previous commitment and, thus, you may need to change a date. The College Board will charge a change date fee that, at the present time, is $29. Can I get a copy of the test? Yes, you may order the Question and Answer Service (QAS) for $18 within five months of the date in which the test was taken but ONLY for the following test dates: October, March, and May. What is the Student Answer Service (SAS) ? This is an additional service ($13.50) that lists all questions of the test taken and it list whether the student answered the question correctly, incorrectly or omitted. it also states the level of difficulty. This is a very valuable tool. We highly recommend that all students trying to get some SAT test preparation and retaking the test to get this service. It is available with all test dates. However, the results from this report might not be available until after the next test date. What is the registration schedule for the current academic year, and when should I start preparing? Here is a brief summary to the test dates for the current academic year and our suggested start date to prepare based on an average 10-week preparation time. Call us at least 10 to 12 weeks ahead of the test date to get a diagnosis of what is needed for your particular case and to be able to get you into our schedule. The ACT standardized test is designed to assess high school students' general educational development and their readiness to complete college-level work. It is used for college admission decisions, some scholarship qualifications, and NCAA eligibility. All US colleges and universities accept ACT results. When does my student take the test? The ACT is offered six times during a given school year. These are usually in September, October, December, February, April, and June. Students generally take the test first during the spring of their junior year. It is best to take it as early as possible, as your student may want to take the test again to get the best score possible. For exact dates, please click here. When and how do I register? A registration packet should be available at your student’s high school, but you may also register online at www.actstudent.org. Try to register at least eight weeks in advance. The sooner your student registers, the easier it is to get your student’s ideal location. Each test date has its own registration deadlines and locations available. The English test is a 75-question, 45-minute test, covering mechanics and rhetorical skills. The test will contain five different types of prose passages, each one accompanied by multiple-choice test questions. The math test is a 60-question, 60-minute test designed to measure the mathematical skills students have typically acquired by the end of their junior year (pre-algebra, algebra I, algebra II, coordinate geometry, plane geometry, and trigonometry.) The questions presented require reasoning skills to solve practical problems in math. Students will be allowed to use an approved calculator but will not be required to perform any extensive computations. The reading test is a 40-question, 35-minute test that measures reading comprehension. Students are asked to read several passages and answer questions to show understanding of what might be stated or implied in the passages. The test comprises passages that are representative of the reading required in first-year, college-level courses. Passages will cover topics in social studies, natural sciences, prose fiction, and the humanities. The science test is a 40-question, 35-minute test that measures skills required in sciences such as: interpretation, analysis, evaluation, reasoning, and problem solving. The test assumes that students have taken three years or more of high school science courses. The test presents seven sets of scientific information (graphs, tables, summaries, conflicting view points, etc. ), each followed by a number of multiple-choice test questions. The question will require a good understanding of the concepts presented and critical analysis of the information presented as to draw conclusions and generalizations. The writing test is a 40-minute essay test that measures writing skills. An issue is defined and described in a prompt with three points of view on that topic. Students need to take a position on the issue and present it in their essay after analyzing and evaluating all three perspectives provided. Students need to substantiate their own perspective, while explaining the differences between their perspective and those provided. How is it scored? Each subject (English, math, reading, and science) is scored from 1 to 36, and then the composite score is calculated as an average, with the highest being a 36 overall. The scores are rounded to the nearest whole number. Fractions less than one-half are rounded down; fractions one-half or more are rounded up. Each score is a scale score – which means that is equivalent to all the different forms of the ACT, no matter which test date a test was taken. Because the ACT essay section is optional, its score does not affect the overall composite score. How many times can I take the test? A student can take the test multiple times without penalties, but we recommend students make no more than three attempts. What should my student bring to the test? Your student should bring an approved calculator, a snack, pencils, his or her ticket, and a picture ID. Do not bring a phone. Which Calculators are approved? Many well-known brand calculators are prohibited, such as the following: Texas Instruments: any model that begins with TI-89 or TI-92 or the TI-Nspire CAS (the TI-Nspire (non-CAS) is permitted); Hewlett-Packard: hp 48GII and any models that begin with hp 40G or hp 49G; Casio: Algebra fx 2.0, ClassPad 300, and any models that begin with CFX-9970G. In essence, any calculator with a built-in computer algebraic system will not be allowed. For up-to-date information on prohibited calculators, please click here. What are the costs of the test? The test costs change year by year. In fall 2018 it is $67.00 with the writing section and $47.50 without. These fees include reports for the student, his or her high school, and four schools of the student's choice. For more information on fees, please click here. Can I change a date once registered? Yes, life situations may keep your student from being able to meet a previous commitment and, thus, you may need to change a date. The ACT organization will charge a change date fee, which, at the present time, is $26. Can I get a copy of the test? Yes, you may order the Test Information Release (TIR) it within three months of the date that the test was taken but ONLY for the following test dates: December, April, and June. There is a fee of $15 for the TIR service, and it is well worth it especially if your student took his or her first test during one of those months. What is the registration schedule for the current academic year and when should I start preparing? Click here to see our test tracker - where you will see a brief summary to the ACT test dates for the current academic year and our suggested start date to prepare based on an average 8 to 10 week preparation time. Call us at least 12 to 15 weeks ahead of a test date to get a diagnosis of what is needed for your particular case and to be able to get you into our schedule. It will all depend on the date – see our OFFICIAL TEST TRACKER. Is the ACT easier than the SAT? No. However, here's a better question: “Is the ACT easier or better than the SAT for me?" The best way to determine this is to take our ACT vs. SAT Comparison Test. Some students definitely do find the ACT to be easier than the SAT, while others find it equally or even more difficult. The ACT tends to be more straightforward and less cryptic than the SAT. The ACT has a science section; 84% of the ACT science questions involve data analysis, mostly interpreting graphs and charts. ACT grammar has a different emphasis than SAT grammar, and the questions are all reading-passage based. Many consider the ACT reading section to be harder than the SAT reading section. For many, it is difficult to finish within the time allotted. Unlike questions on the SAT, the ACT reading questions do not follow the order of the passage. Slow readers may have a great deal of difficulty with the ACT. Should I take the ACT in addition to the SAT? No. For most students, that is not a good idea. First, figure out which test is best for you, then focus on that test. Vogel Prep's ACT vs. SAT Comparison Test is a great place to start. I have heard that Midwest colleges prefer the ACT, while East Coast and West Coast Colleges prefer the SAT. Is this true? No. Colleges do not prefer one over the other. Marilyn McGrath-Lewis, director of admissions at Harvard University, says, “Either is fine with us, and we don't have a feeling that either favors students with any particular profile.” It would be difficult to find one college that does not accept the ACT as readily as it accepts the SAT. Some colleges even accept the ACT in lieu of both SAT and SAT Subject Tests! Taking the SAT vs. ACT Comparison Test is the best way to figure out which test to focus on based on your skills and knowledge. Below is a comparison about the format, design, timing, and number of sections and questions for each of the tests. To schedule a SAT vs. ACT Comparison Test, check out our assessment schedule and register. Start with our ACT vs. SAT comparison test to help you decide whether the SAT or ACT is a better test for your student. Follow up with one our ACT or PSAT/SAT test prep classes. Click here to see our small class schedule.